There are numerous tourist attractions in the land of Uttar Pradesh. Taj Mahal is a beautiful architecture and famous all over the world. It was built by the Mughal Emperor Shah Jahan in memory of his beloved wife. It is as much as a symbol of India. As we all know that it is also one of the Seven Wonders of the World. Visitors can visit Varanasi which is the oldest city in the world. It has two major religions, Hinduism and Buddhism. The charm of city is its very old temples. Hindu monks worship along the ghats of the holy river Ganges. Sarnath is near to Varanasi where Lord Buddha delivered his first sermon. Ashoka the great built a Stupa here in 234 BC. Lucknow is famous for music and Urdu poetry. Remnants of Nawabi Palaces, Imamabaras and the exquisite traditional handicrafts are main attraction of this city. Kushinagar is situated about 51kms from Gorakhpur where Lord Buddha passed away. Tourist can see the Nirvana Temple housing the statue of "Reclining Buddha" and a number of Stupas. It is one of the major centers of Buddhist pilgrimage. Dudhwa is one of the finest tiger reserves of India and one of the important tourist attractions in Uttar Pradesh. People may also come across a variety of other fauna, namely: Leopard, Swamp deer, Hispid hare, Bengal Florican etc. Fatehpur Sikri was built in the period of Akbar and it was supreme architectural achievement of, his Capital City near Agra. The construction of the walled city began in 1569 A.D. and completed in 1574 A.D. This comprised of the most beautiful buildings both religious and secular which testify to the Emperor's aim to accomplish social, political and religious integration. The religious edifices worth mentioning are the Jami Masjid and Salim Chisti's Tomb. The tomb built in 1571 A.D. in the corner of the mosque compound and it is a square marble chamber with a veranda. The cenotaph has an elegantly designed network screen around it. FatehpurSikri nestled on rocky ridge, 3 kilometres (1.9 mi) in length and 1 km (0.62 mi) wide, and palace city is surrounded by a 6 km (3.7 mi) wall on three side with the fourth being a lake at the time. Its architect was Tuhir Das and was constructed using Indian principles. The buildings of Fatehpur Sikri demonstrate amalgamation of various regional schools of architectural craftsmanship such as Gujarat and Bengal. This was because native craftsmen were used for the construction of the buildings. Influences from Hindu and Jain architecture are seen hand in hand with Islamic elements. The building material used in all the buildings at FatehpurSikri, palace-city complex, is the nearby quarried red sandstone, known as 'Sikri sandstone. It is accessed through gates along the five-mile long fort wall, namely, Delhi Gate, the Lal Gate, the Agra Gate, Birbal's Gate, Chandanpal Gate, The Gwalior Gate, the Tehra Gate, the Chor Gate and the Ajmere Gate. Buland Darwaza: It is great mugal architecture and magnificent gateway added later in 1571-72 to celebrate Akbar's invasion of Gujarat. It was constructed with red sand stone and marble. It is most perfect architectural achievement in the whole of India. A flight of steps lead to the gateway which is about 53 metres in height and 39 metres in width. Entrance is through a huge arched domed recess. A broad rectangular strip bordering the archway has calligraphic inscriptions on it. At the corners are slender turrets. The gorgeous perforated parapet and the row of kiosks with cupolas add to the decorum of the monument. Writing on the gateway confirms to Akbar's religious toleration. Jama Masjid: It is a Jama Mosque meaning the congregational mosque, and was one of the first buildings to come up in the complex, as its epigraph gives AH 979 (A.D. 1571-72) as the date of its completion, with a massive entrance to the courtyard, the Buland-Darwaza was added some five years later. It was built in the manner of Indian mosques, with diwans around a central courtyard. A distinguishing feature is the row of chhatri over the sanctuary. There are three mihrabs in each of the seven bays, while the large central mihrab is covered by a dome, it is decorated with white marble inlay, in geometric patterns. Tomb of Salim Chishti: A white marble covered tomb of the Sufi saint, Salim Chisti (1478â€“1572), within the Jama Masjid's sahn, courtyard. The single-storey structure is built around a central square chamber, within which is the grave of the saint, under an ornate wooden canopy encrusted with mother-of-pearl mosaic. Surrounding it is a covered passageway for circumambulation, with carved Jalis, stone pierced screens all around with intricate geometric design, and an entrance to the south. The tomb is influenced by earlier mausolea of the early 15th century Gujarat Sultanate period. Other striking features of the tomb are white marble serpentine brackets, which support sloping eaves around the parapet. Diwan-i-Aam :Diwan-i-Am or Hall of Public Audience, is a building typology found in many cities where the ruler meets the general public. In this case, it is a pavilion-like multi-bayed rectangular structure fronting a large open space. South west of the Diwan-i-Am and next to the Turkic Sultana's House stand Turkic Baths. 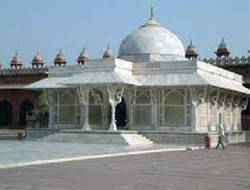 Diwan-i-Khas: The Diwan-i-Khas, or Hall of Private Audience, is a plain square building with four chhatris on the roof. However it is famous for its central pillar, which has a square base and an octagonal shaft, both carved with bands of geometric and floral designs, further its thirty-six serpentine brackets support a circular platform for Akbar, which is connected to each corner of the building on the first floor, by four stone walkways. It is here that Akbar had representatives of different religions discuss their faiths and gave private audience. IbadatKhana: It was a meeting house built in 1575 CE by the Mughal Emperor Akbar, where the foundations of a new Syncretistic faith, Din-e-Ilahi were laid by Akbar. Panch Mahal: A five-storied palatial structure, with the tiers gradually diminishing in size, till the final one, which is a single large-domed chhatri. Originally pierced stone screens faced the faÃ§ade, and probably sub-divided the interior as well, suggesting it was built for the ladies of the court. 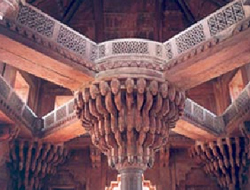 The floors are supported by intricately carved columns on each level, totalling to 176 columns in all. 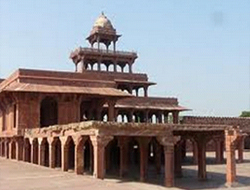 Birbal's House: The house of Akbar's favorite minister, who was a Hindu. Noteworthy features of the building are the horizontal sloping sunshades or chajjas and the brackets which support them. 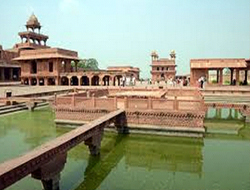 Currently, Fatehpur Sikri is World Heritage site. Various architecture building in this area such as the PanchMahal , or Palace of Five Storeys, and the Buland Darwaza, a massive gate which provides entrance to the complex, quantify among the premium specimens of Mughal architecture. It is sometimes argued among architecture experts that Fatehpur Sikri is the greatest achievement of Mughal architecture, better only in standing but not in its attractiveness and the awe it inspires by the Taj Mahal. The cultural politics of the site remains to be written. Perhaps the enormous chess board, where human figures were used as chess pieces and moved at the emperor's will, provides a signal. Although the palace and city of Fatehpur Sikri are remarkably well preserved, the design and decoration present a problem of interpretation. First it should be pointed out that, although the city was not inhabited for very long, at least two phases of construction can be discerned. It is world fame architecture and considered to be splendid accomplishment in the whole range of Indo-Islamic building. It was constructed by Shah Jahan who was the 5th Mogul emperor of India, as a burial place to his darling wife Ar-ju-mandBanu Begum, a Muslim Persian princess recognized by her other name, Mumtaz Mahal, which means, the eminent of the Palace. Its known architectonic magnificence has a rhythmic blend of solids and voids, concave and convex and light shadow; such as arches and domes further increases the aesthetic aspect. The colour combination of lush green scape reddish pathway and blue sky over it demonstrate cases the monument in ever changing tints and moods. The relief work in marble and inlay with precious and semi-precious stones make it a monument apart. The Taj Mahal is in fact an architectural complex and comprises of five main elements. The Mausoleum (which is known as the Taj Mahal) with four minarets, a Mosque, a Rest House or the Response placed opposite to give it symmetry, the main Gateway and the garden. All were built as vital part of a single unit, carefully planned to harmonise, as a law of Islam decrees that once a tomb is completed nothing can be added or be taken away. The distinctiveness of Taj Mahal lies in innovations done by the horticulture planners and architects of Shah Jahan. One such genius planning is the placing of tomb at one end of the quadripartite garden rather than in the exact centre, which added rich depth and perspective to the distant view of the monument. The ground plan of the Taj Mahal is in perfect balance of composition, the octagonal tomb chamber in the centre, encompassed by the portal halls and the four corner rooms. The plan is repeated on the upper floor. The exterior of the tomb is square in plan, with chamfered corners. The large double storied domed chamber, which houses the cenotaphs of Mumtaz Mahal and Shah Jahan, is an ideal octagon in plan. The beautiful octagonal marble lattice screen encircling both cenotaphs is a piece of excellent workmanship.